ENJOY OUR QUIET COUNTRY SETTING! 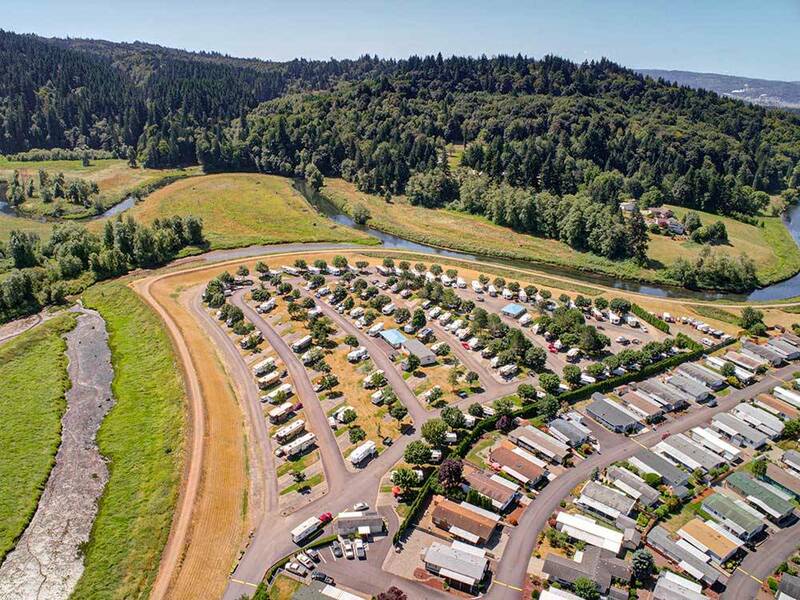 By I-5, our BIG RIG friendly park is centrally located between Portland, OR/Vancouver, WA/Mt. Rainier/Mt. St. Helens - all a day trip away and 6 hours south of Vancouver, BC. Shopping. Fishing in 3 nearby rivers. Older facility. This park is next to a trailer park, the grass is moderately maintained, although you'll be instructed not to park on it (common sense, but I digress). Plenty of 'additional rules' as posted throughout the park, the cost of the stay is not reflective of the quality of the resort. Totally disappointed, again of the lack of customer service and friendliness at this campground. The place itself is wonderful, level pull throughs so we didn't need to unhook for our overnight stay, bathrooms impeccably clean and awesome showers. The wifi wasn't the best, but the cable tv was nice to have, to catch up on the news. BUT again.....(thought we would give them a second chance) the lady in the office checking us in, is the most unfriendly, grouchy person we have ever encountered during our many years of RVing.. We felt like we had done something wrong by arriving to spend the night. We politely asked a few questions and were "barked" the answers. I asked her nicely if the Good Sam discount was 10% , and she replied with, l'm not sure. Really, you're not sure? How long have you worked here? We paid $55, so not sure if she gave us the discount or not. Is she's the owner, l understand why she is still working there, if not, they should read these reviews and think about a change of staff! Pretty sure we will go down the road aways next time and try someplace different! 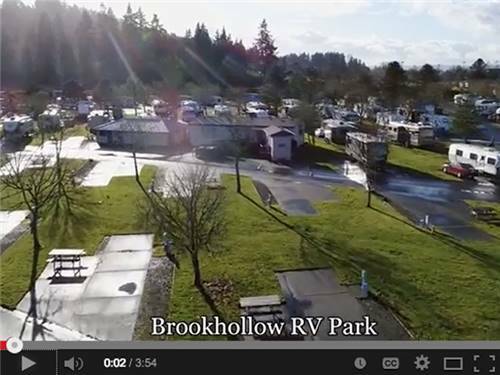 We have stayed at Brookhollow before and looked forward to our return. The sites are spacious, level and great for big rigs. The staff are friendly and we noticed improvements in the bathrooms and the other buildings - it always feels good to be at a park where investments are being made to improve them! We enjoyed seeing otters in the water by the walking trail. The trail is a great feature with pretty views. We also saw various birds and some deer. The location is good for day trips toward Mt St Helens where we really enjoyed the interpretive center and great views. The staff were very friendly. This park is a quiet enjoyable location and we hope to return again. 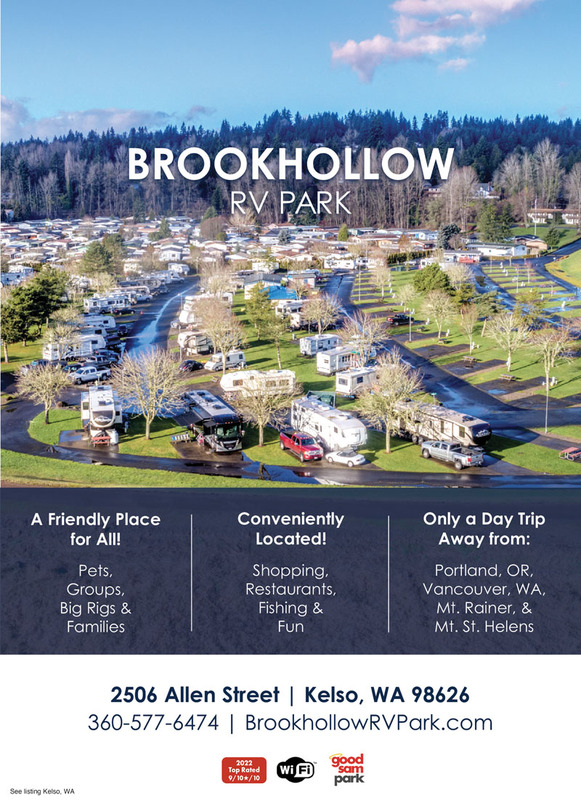 My wife and I stayed at Brookhollow RV Park in Kelso, Wa. in mid July 2016. We chose this park because of it's high rating and because it close to our children/grandchildren in the Longview area. When we arrived, we were very pleased with park and the layout. Nice sized concrete pads and grass area for each site. Also, the park was reasonably quiet despite only being about a mile from the freeway. We thought we found us a nice place to stay. We decided to go ahead and book for a week for the weekly discount offered. The first night we had our family over for hamburgers & hotdogs. Our neighbors to one side were two older ladies that were not very friendly. They complained about us making to much noise. We found this out a few days later as the camp manager called us with quite the laundry list of what we were doing that annoyed our neighbors. When I explained non of it was true the manager still seemed to side with our neighbors. Being a little upset with this I went to the office to explain that their yappy little dog had been annoying us since we had arrived but we decided to put up with it as the owners would make a half hearted attempt to control the dog. I will tell you that at no rv park that we have been to have I felt so unwelcome. We were amazed! It bears mentioning that non of our other neighbors had made any complaints about us. We decide to cut our stay with them short due to what we feel was a very inhospitable atmosphere. This experience will go down in our history as the worst rv park experience to date. We will not go back ever and will let everyone know we talk with about our experience here. I should have read the Trip Advisor reviews on this place before we booked as they clearly show we are not alone in our feelings. We have never been treated as rudely as we were at this park. The park looks beautiful and peaceful when you arrive, but one trip to check in and that all changes. I honestly do not know how they stay in business because you don't feel welcome. Our space, which is advertised to fit two vehicles plus our rig, was only large enough for our 5th wheel if we wanted our awning out. We had to park our pickup a fair distance from our site. We will never go back. Overall this was a nice campground but it is in the bottom of a valley. We enjoyed the park though there was little shade on the east side of the park. There were a few trees on the east side of the park but were small. The park does not have much for views since there is a berm on the east side, but it does provide a great walking trail. The only issue is they do impose the fee for a dog(s). We were on a 6 week tour and this was the only park we encountered that imposed the dog fee.